John Steed: I asked the chief predator where to find you and he said, 'Our Mrs. Peel is in ladies'underwear.' I rattled up the stairs three at a time! Mrs. Peel: Merry quips department on the FIFTH floor, sir. - Patrick Macnee, Diana Rigg, from the episode Death At Bargain Prices. Doctor Who, The Saint, Monty Python's Flying Circus, TheTomorrow People...the list of great British television just goes on and on (and, yes, that lastone was my little joke. Hey, I grew up on British sci-fi and if it wasn't Tomorrow Peopleit was Children of the Stones). The British Isles have certainly produced some greatshows, and among them is also, of course, The Avengers. The quirky and sometimesbizarre series is a hallmark of world television. Lasting from 1961 to 1969, the original run of theseries (prior to its resurrection as The New Avengers in 1976) survived a decade wheretelevision went from basic entertainment into a cutthroat ratings game. It even managed to crossthe pond and hit US television where it enjoyed success, although when it was eventually slotted against "Laugh-In", it failed miserably—some say this contributed to the show's demise. The general story concerns one John Steed (Patrick Macnee), aspecial agent for the British government. Steed is part of a hush-hush security branch known as"The Avengers", where he is often partnered with women agents who have intriguing and strongpersonalities. This isn't your average spy/crime thriller series, though. Steed and partner are often faced withbizarre foes, from cyborgs to teddy bears to insane clowns. Anything goes in this highly originalseries, where even the most banal scenes are spiced up by the witty and dynamic dialogue betweenSteed and his female partners. With The Best of The Original Avengers, A&E hopes tobring fans the six episodes generally considered the "cream of the crop." Six episodes? Considering The Avengers lasted something like 120 episodes, I'm not surethe devoted fans will quite agree that merely six can really contain the "best" material the serieshas to offer. More accurately, this set is a very good sampler of everything great about The Avengers, but certainly too small to be really authoritative. The first episode in the set is Mr. Teddy Bear, dating back to 1962 and the series' secondseason. Steed is paired with Mrs. Cathy Gale (Honor Blackman) here, and the both of themdecide to solve a crafty murder mystery. When a famous colonel drops dead on live television,Steed suspects one Mr. Teddy Bear, a deadly foreign assassin, of performing the job. He andMrs. Gale put together a clever sting operation to capture Teddy, but will it work? In the nextepisode, Don't Look Behind You (1963), Cathy Gale is invited to spend the weekend ata mysterious mansion, but when she arrives she finds a mentally unbalanced girl in charge. After being left by herself, things get even stranger as some unseen prankster continues to makeher evening a spooky affair. Next up, Steed is paired with the ever-popular Emma Peel (DianaRigg) for Death At Bargain Prices (1965), where Mrs. Peel takes up a job as a lingerieclerk in a department store. Why? To uncover a hidden crime beneath the surface, possibly evena secret lab! Disc 2 starts off with Too Many Christmas Trees (1965), where Steed andEmma are faced with the possibility of mind-control making Steed reveal national secrets. Wemove on to 1968 where Steed is paired with Tara King (Linda Thorson) in Look (Stop Me IfYou've Heard This One Before), where they must do battle with a group of vaudevilleperformers who just might also be the best thieves in England; arguably one of the most definitiveepisodes of the entire series. Finally, All Done With Mirrors puts Steed and Tara upagainst a scientific menace that uses the power of the sun to do all sorts of nasty things. These episodes are quite good and represent the essence of The Avengers playful,spirited, and satirical spirit. They're not a replacement for actually watching the series, butcertainly they pack a punch. Once again, British television proves it can show a 30-year-old series and still say, "It's pretty damn good, isn't it?" And it is. At the very least, this setproves that even the series' final seasons (with Linda Thorson) have good stuff to offer, despiteoften being unfairly criticized for going downhill after the departure of Diana Rigg. The episodeshere also have a few interesting aspects, such as the early appearance of John Cleese inLook (Stop Me If You've Heard This One), as well as early performances by manyrecognizable British actors, prior to bigger performances. Hopefully, the recent release of The Avengers movie (which I didn't think was quite asbad as most did) will spark up new interest in this amazing series, and what better way to getyourself acquainted with it than these 6 shows? Image Transfer Review: The 1962-63 episodes were filmed on early video and, as a result, are a bit on the messy side. While the transfer runs at 10mbps and is completely clean, these episodes are a bit blurry and hazydue to the technology of the day. The other episodes, recorded on film, are markedly better. Other than some moire patterning (most likely a problem based within my own TV, not the disc),the transfers are free of artifacts and pixelization. The color episodes are brilliantly vivid and inamazingly bright condition. Audio Transfer Review: The 2 channel Mono soundtracks for these episodes are cleanly engineered and sound extremelygood given their overall age. I even detected some good bass crossover in the later episodes. Other than some muddy moments in the earlier episodes (from 1962 and 1963), everything heresounds very nice, music and dialogue are clear and perfectly understandable. Opening commentary by Patrick Macnee. Historical introduction by Patrick Macnee. Alternate US opening sequence for the Macnee/Rigg series. Linda Thorson as "Tara King" promotional reel. Extras Review: Each disc in this set features an overall introduction by Patrick Macnee, John Steed himself. Thisintro is a brief historical piece on the evolution of the series and how it suffered when ported toU.S. television. 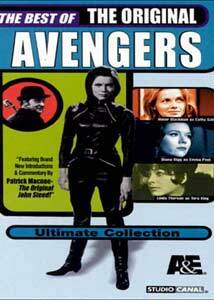 Oddly enough, Macnee makes no mention of The New Avengers, inwhich he starred. Each episode features another introduction by Macnee, this one relating to that episode only. Again, Macnee discusses some minor historical details, plot outlines, and why he thinks it's anenduring episode. Each disc also contains the alternate version of the "chessboard" opening sequence. For a time,during the Macnee/Rigg days, the intro sequence was done on a large chessboard, and when theseries hit the U.S., this intro was given new music and opening dialogue (the famous"Extraordinary crimes against the people and the state must be avenged." line). I'm not sure whythis was included since none of the episodes on this disc are from that period. Disc 2 contains a 9-minute promotional short about actress Linda Thorson. I assume this shortwas aired on television to hype up her role in the new season, and for something most likely culledfrom the vaults of the BBC, the quality is amazing. Ads for the Original Avengers website are included, andthe general packaging and presentation are decent. My only complaint would be the lack ofchapter indexes on the keepcase inserts, which actually have no info on these discs at all; insteadthey're advertisements for the other Avengers sets. Die-hard Avengers fans should enjoy this box for its wonderful quality, but others maywish to rent this set before comitting to it. It's an excellent handful of episodes, but it IS still just ahandful. Recommended.